BANGKOK - DECEMBER 11, 2017: Busy Khao San road with walking tourists, time lapse view. hd00:06BANGKOK, THAILAND - DECEMBER 2017: Tourists walk in Khao San Road. It is lined up with budget hotels, shops, massage salons, bars and restaurants and very popular among backpackers. hd00:15BANGKOK - DECEMBER 2017: Unidentified tourists stroll in the evening Khao San Road, a world famous "backpacker ghetto"
4k00:06Bangkok, Thailand-February 15, 2019: People and Chinatown in Bangkok. 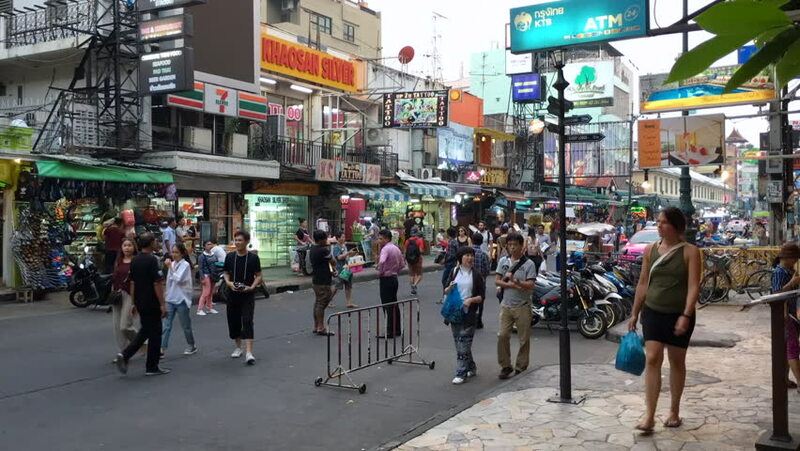 Yaowarat Road (China Town) is famous for street food and lively environment.